Be careful in the fierce Spanish sun. It is easy to get sunburned or dehydrated. Luckily, suncream helps avoid looking like a fried lobster and a full range of restaurants and bars by the Arenal Beach are ready with refreshments and delicious meals. On the Arenal Beach strip itself there are more than 50 restaurants each delivering their own special take on cuisine from countries such as Spain, Italy, Austria/Germany, Thailand, India, China, Indonesia and many more. Spain is famous for its Mediterranean cuisine with huge paella pans of goodies to share being the most popular dish. 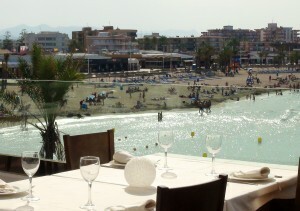 Locally the Paella Valenciano is the dish of choice with a generous supply of fresh seafood ingredients. 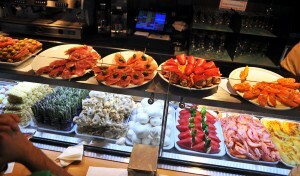 The tapas bars are plentiful and generally of extremely high quality with heaps of interesting choices on their menus. 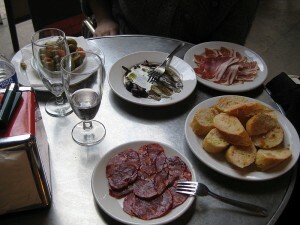 The idea of tapas is to sit down a little gang of people or as a family, order a couple of different tapas dishes each and have them all delivered on the table for sharing freely among everyone. This way you can taste several delicious mini meals without settling on just one item on the menu and the choices of others might help challenge you to try things you would have never ordered yourself. Paella is another social meal concept. Normally you order a paella as a minimum of 2 people, though some places do a small tapa de paella. One big paella pan is brought to the table and if the place is traditionally minded, everyone round the table eats directly from the paella pan. The restaurants in the tourist areas have typically adjusted the paella service to include individual plates to be filled from the pan. 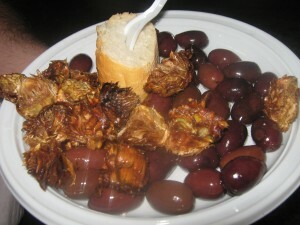 Vegetarians in Javea have a relatively easy time finding excellent meals compared to most places in Spain. Particularly in the Arenal part of Jávea most restaurants have multiple menu options for vegetarians and a general willingness to go off-menu to deliver exactly what your taste buds fancy. On the Arenal alone several Indian restaurants are ready with a wide range of vegetarian options, the Michelin Guide listed The Great Indian being a prime example. The Monsoon Thai restaurant has tofu options of all their meals. Superb Italian restaurants Pepas Pizzeria and the food artists of Lungo Mare both have pizzas, pastas and several other vegetarian items on the menu. 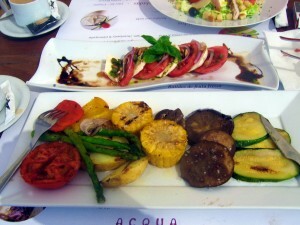 Even the main steakhouse on the Arenal, Acqua, has a huge impressive bbq style dish with fried vegetables. Most Spanish restaurants in the area will do a vegetarian paella and/or several kinds of tapas without meat such as patatas bravas, onion rings, cheese bowls and omelets. This entry was posted in What To Do In Spain and tagged acqua javea, cheese, Paella Valenciano, patatas bravas, restaurants, spain, tapas, vegetarian food, vegetarian javea. Bookmark the permalink. can’t wait to get back to Javea, 4 weeks to go.